Yahoo's photo-sharing site has had a massive revamp, with 1TB of space for everyone -- although its launch was far from smooth. A radical revamp of veteran photo-sharing site Flickr came slightly unstuck last night when users rushing to make the most of its impressive 1TB of free storage smacked into the old monthly upload limit -- just 300MB. The service is owned by Yahoo, fresh from its $1bn acquisition of similarly vowel-averse social site Tumblr and keen to make a second splash in one day. CEO Melissa Mayer unveiled the Flickr redesign at an event in New York last night. But the big news -- that all users can store up to 1TB of photos for free -- was somewhat undermined when it transpired that the old 300MB monthly upload limit was mistakenly still in place. While wags calculated it would take 277 years to reach your personal limit at that rate, Flickr was quick to fix the bug. "A few terabytes were having trouble finding their owners," the service wheedled on Twitter earlier this morning. "Now all straggling bandwidth & video upload limits have been lifted, as promised." The site says 1TB is enough for over 500,000 full-size photos at "the resolution of today's most commonly used smart phones" or 6.5 megapixels. If you've got a 13-megapixel flagship phone such as the Samsung Galaxy S4 though, that's more like 270,000 photos. Still, if you uploaded 50 photos a day it would still take you nearly 15 years to fill that up. There's even a new Android app to help you do that. Flickr has also changed its Pro service, doubling the fee to $50 (£33) per year and offering nothing over the free account except removing ads (it's now called 'ad-free', not 'Pro'). 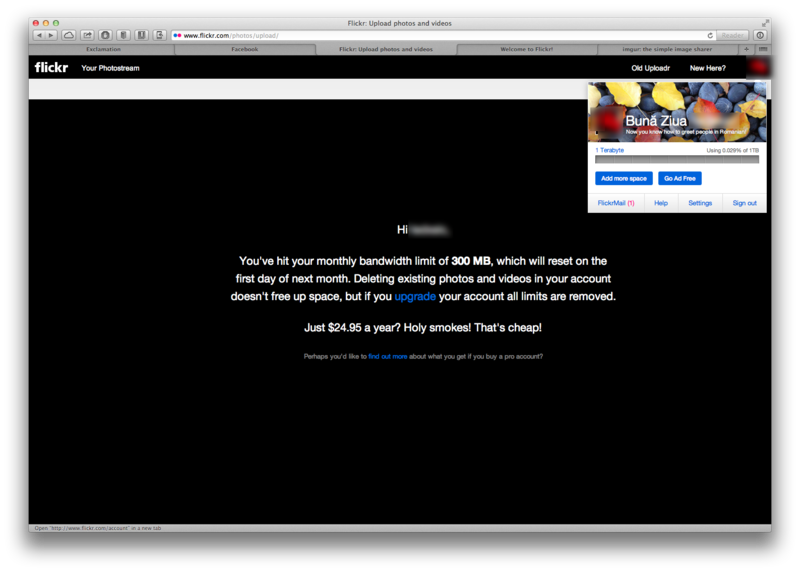 There's also a super-pro 'Doublr' offer for $500 per year that gives you 2TB of space. There's no longer an unlimited option. If you're a Flickr power user and wonder what other options there might be, my colleague Josh Lowensohn has done a roundup over at our sister site CNET News. What else has changed? You can upload photos up to 200MB in size, and videos with up to 1080p resolution, 3 minutes in length and 1GB in size. No one will have those smug little Pro badges any more. Oh, and the whole site looks completely different. It's radically diminished the amount of white space on every page, turning discovery and user profile pages into fullscreen streams of images. What do you think of the redesign? Are you more or less likely to use it now? Are you a Pro user happy to go free? Or mad that you have to put up with ads or pay double? Give me a snapshot of your thoughts in the comments, or upload your thinking to our Facebook page.